Often times teachers ask many questions about how to get children to learn. One question, that we often hear is “how can you possibly build intrinsic motivation in a student that just doesn’t care?” There is no clear cut or definitive answer to this, but there are things that work with some of the students. One thing that we have seen work well is the idea of student led conferences. ​ Current trends in education focus on student empowerment and ownership and we have been able to embody this within our classroom environments and instructional practices. The next logical step was transferring that over to the way we conduct our parent conferences. Students are often particularly interested and enjoy “being the teacher,” so why not give them the opportunity to be their parents’ teacher, while simultaneously alleviating some of your own teacher burdens and worries about how the conference is progressing? Student led conferences have been amazingly beneficial and effective in our school environment. How can you set-up student led conferences in your classroom? Both of us decided that it would be the best idea to have a checklist for the student’s to follow about what they need and want to share with their parents. The checklist helped students stay on track and also comforted students that were nervous or needed additional support. Some kids used it explicitly, while others just started talking about the classroom learning and didn’t really utilize it (even though they still progressed through all of their talking points). Kate: Shortly after the second report card of the year went out, it felt like a logical time to implement student led conferences. We decided to hold a “Learning Celebration” where all students could invite their parents or a staff member (if a parent was unable to attend.) We took the morning and all went into the cafeteria. When parents arrived, students were able to lead them to the meeting area to walk them through their data binders which contains evidence of all academic and non-academic data and tracking. Students were able to explain to their parents their preferred learning styles, standards that have been mastered or standards that need additional practice, goals they have set for themselves, inquiry-based presentations, projects, etc. Parents were amazed at how much their child new about their own learning. Students were answering questions and I was able to be there for clarification or giving advice on how to expand on the skill at home. It was amazing to see the academic conversations that were happening amongst students and parents. Since we have a high Hispanic population, I was able to have our translator there for additional support with communication between parents, myself, and students. However, she was used rarely since our students were doing most of the translating and parents were quite elated to hear how well the students spoke about their learning and goals. After the conference had concluded, the students and parents were able to enjoy breakfast together and discuss current projects, do a room tour, or just enjoy each other’s company. We did have certain students designated as photographers to catch all the action. After parents left, students got the opportunity to write thank you letters to their parents for attending their conference. Preparing the students attributed to the success of the student-led conferences. 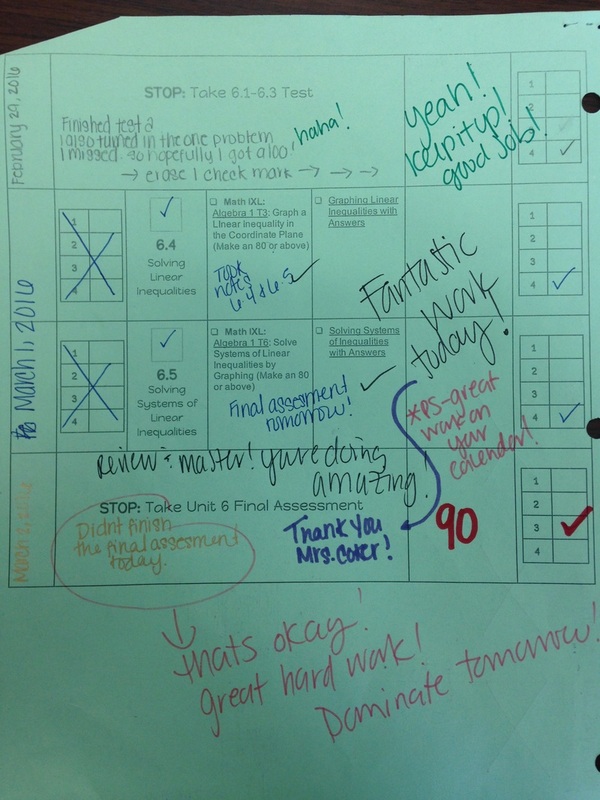 The day before, students were able to practice on a classmate with the provided checklist. Reminders were sent home after the initial invitation to parents or teachers to ensure all students had the opportunity to discuss and celebrate their learning. Jason: We set up the time for our conferences later in the year. Since we are a personalized learning classroom it was okay for the students to give their parents the tour and conference during the day or after school during the hour prior to our PTO celebration. We had parents coming in Thursday night and all day Friday. At one point in the evening, there were 4 parents in here at once and the students were able to explicitly speak to our routines, grades, projects, and mastered standards, while I circulated the room and answered specific questions and what-not. Additionally, some parents were unable to attend, so they set up additional times to come in and see this. The kids absolutely loved the chance to be the teacher and to explain their presentations, projects, and student-made games, but what about the kids with parents who are extremely busy? If this is a process that works, it is important to have a backup idea just in case something goes amiss. Structure and pre planning were essential. After the initial note was sent home, we were able to pinpoint parents that were unable to attend, so in an effort to ensure that each child had a chance to present and showcase themselves, they wrote a letter to another teacher in the school, asking that teacher to come and listen to them present about their learning, data binders, etc. This worked well, because they often selected previous teachers, intervention or ESOL teachers that they knew. These teachers got to see them outside of the environment that they typically would and provided them a chance to gather further insight about the child or see their progression into personalized learning from the previous years. 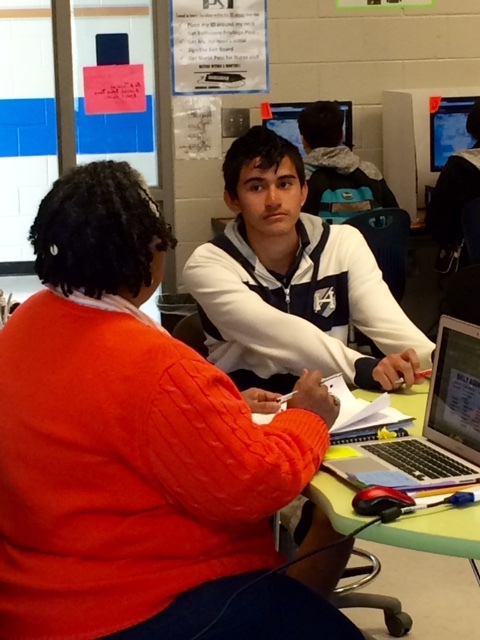 What are the benefits of student led conferences? Confidence: It gives students the chance to be confident and showcase work that they are individually proud of. Communication: Often times it is difficult to communicate with parents of ESOL students, especially if you don’t have a translator available. This eliminates the need for a translator because the kids are able to translate the ideas that they want to present. Availability: As a teacher, we often have scheduling conflicts with meetings, multiple conferences, etc, but this process allows us to have multiple conferences going on at once, and allowing parents to come into the room, while the students are independently working. Less stress on the teacher since pre-planning is in the student’s hands and they have evidence of their learning via data binders. Presentations: Parents like seeing what their kids are doing, but when you transition to a more project-based, presentation-based, technology-based learning style, the parents don’t often get to see the work of their kids (especially without internet at home), but when they can come in and have it explained to them, with the rubrics available, it makes significantly more sense. Students are able to give their parents an accurate depiction of authentic assessments that are done as evidence for their learning. Motivation: This provides intrinsic motivation because many students want their parents or former teachers to be proud of them and what they are doing, so they try to present their best. One child that asked, “... my conference is tomorrow, can I please work on my presentation at lunch because I really want to show my mom?” Who would argue with that? Fluency: We gave our students time to practice and rehearse with a friend, which allowed them to see which things that they spent more time on and what they need to speed up. This allowed them to work on how they wanted to say things and what words to use to present their ideas in the best way. This repeated practice helped them understand their learning more comprehensively because if you have to teach mom or dad about the standards you are learning, you have to truly know them. Practice: We have seen a huge improvement in our students abilities to communicate their needs, wants, desires, and to problem solve, because they are able to communicate more clearly and they take the time to process what they want to say and use appropriate language to communicate with peers and adults.. 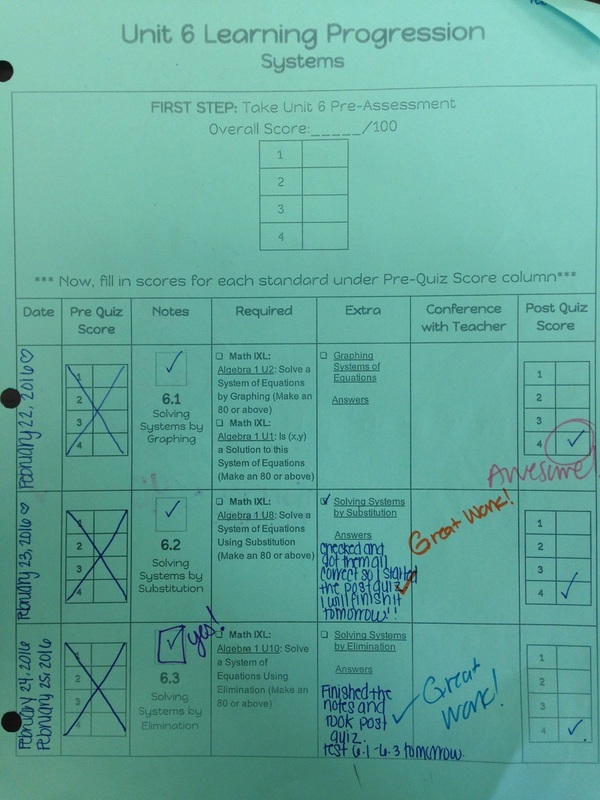 Accountability: Students increased their understanding of standards prior to conferences by reviewing proficiency scales, ability to speak about behavior/academics with rubrics, and keeping real time data about their learning. 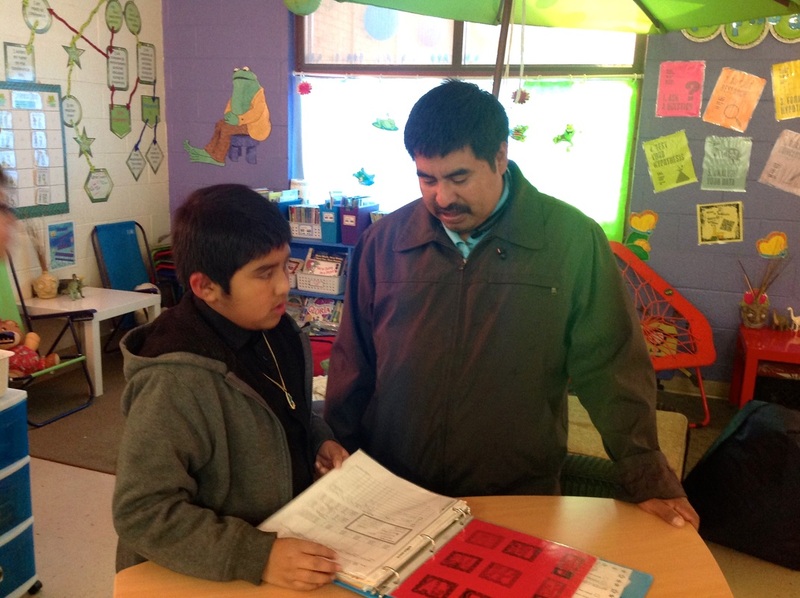 Students are able to engage in open and honest dialogue with their parents. Additionally, parents are motivated to come hear their child speak about their learning. It is easy for parents to forget about conferences with the teacher, but very rarely are they going to miss a conference with their child. Two schools, 40 minutes apart, with the same warrior mascot, united to develop personalized learning student ambassador programs across Stall and Wando High School. ​Stall students put their leadership skills to work collaborating and training Wando PL student ambassadors. PL Student Ambassadors serve as representatives of Personalized Learning to the school’s internal and external communities. As an Ambassador, the students will interact with teachers, administrators, and community members from Charleston and across the nation. An Ambassador must have the ability to effectively communicate how a personalized learning classroom differs from a traditional classroom. The students learned leadership skills to offer tours, lead panel discussions, and collaborate with a professional audience. Take it Personal…You CAN teach an ol’ dog-new tricks! ​​ Having been in education for over thirty years, I have seen a plethora of change, all of which have always sparked some sort of controversy, but ultimately mandated in the spirit of what is best for students. My mantra has always been, “If it isn’t broken…don’t fix it.“ Hence, yearly I have entered my classroom excited to engage my students in teacher-led instruction. This ol’ dog was certain that I knew a thing or two about capturing and engaging students in a lesson that I chose. For the last ten years though, I have realized that it is necessary for me to “modify and adjust” in order to appease new thinking and relate to a new generation of learners. 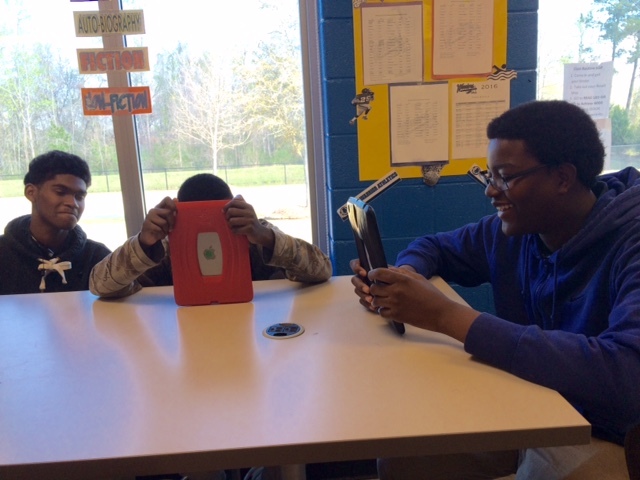 In this quest to adapt to change, I entertained the concept of this thing called “Personalized Learning.” I was hesitant at first, however I slowly but steadily relinquished teacher-led instruction and moved towards student-driven instruction and collaborative engagement amongst my students. What a shocker! They really did know how they learn best and were vying for the opportunity to have “choice“ in how they mastered what was assigned. ​ Herein lies the heart of personalized learning as I watched my students literally outgrowing the need for my direct input in exchange for learning how to learn. I now had to admit that they could share with me or anyone asking, what they were learning, why it was necessary, and how they were going to chart their own course. In all honesty, this ol’ dog could never boast of that “trick” with teacher-led instruction as they learned what I thought was best, when I thought they should master it, and how I said it should occur… or not. My reward -or for the sake of dog training- my“treat” was watching my students engage in conversation with each other and work together to personally chart a learning plan. I was jumping through hoops when I heard them say where they were in their learning and when and how they were going to become proficient. Things aren’t perfect yet as they still have to be skillfully motivated and thankfully at times… they still need ME! To wrap up this dog show, this personal reflection is an ol’ dog barking to sound an alarm: What WAS working no longer works for today’s students, so take it “personally” and consider allowing your students to own their learning. When we were in school there was a mystery of what you were going to learn, how it was graded, and the teacher owned all the information. Transparency in learning has lifted that mystery and bridged the information gap between the teacher and students. As a teacher, part of my job is to be a lifelong learner and I took on the challenge to learn and implement a student-centered personalized learning classroom. My students and I have been blown away by the transformation from a traditional classroom design to a personalized learning classroom. One of the biggest areas I have worked on in my classroom is the concept of transparency. Student learning targets are very specific, clearly worded, and prominently posted. I want my students to know exactly what lies ahead and what they are expected to learn in this course. 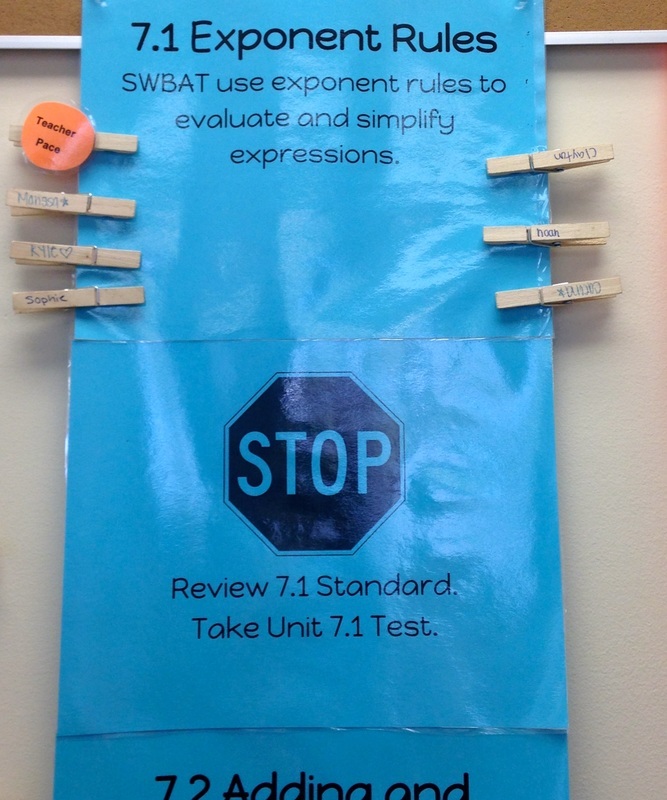 As a result, my classroom is arranged with all of the standards visible. ​Students learning plans also clearly define the learning targets and the aligned activities to prepare students to master the content. 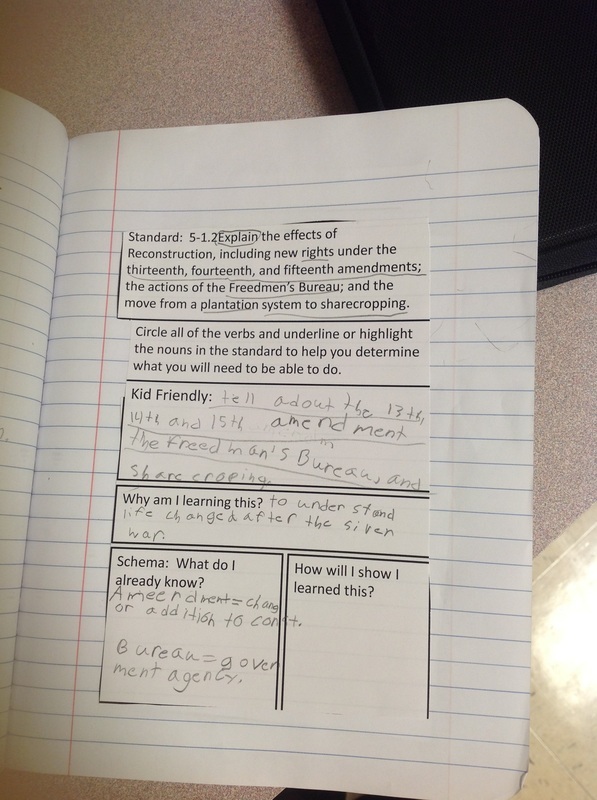 The student learning plan is like their own individualized lesson plan for the standard they are learning. The student takes a pretest to determine their point of entry in the learning progression, completes the aligned activities and small group instruction based on the pretest, and demonstrates mastery once they are confident in their learning. The student learning plan supports the student to be self-directed, guides the learning, and captures all the data and evidence. 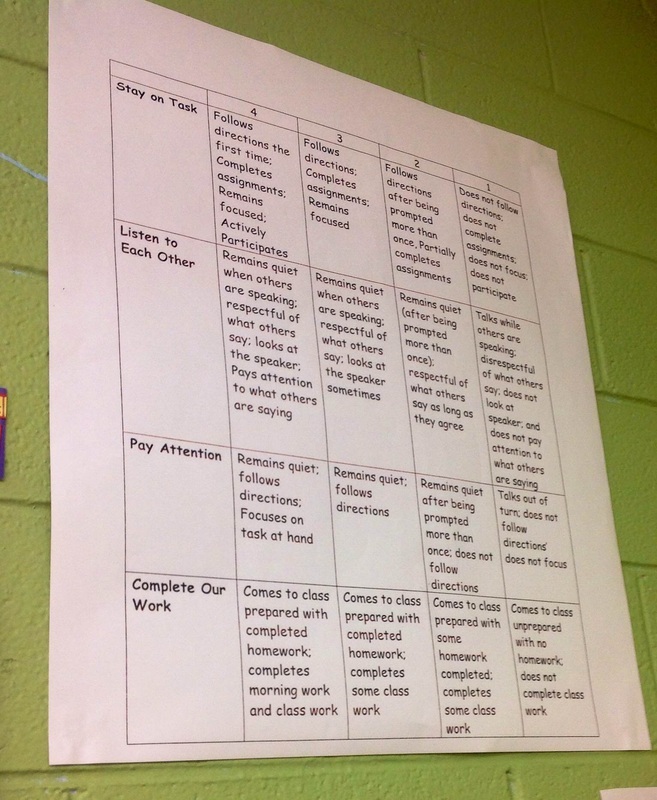 Student learning plans are a huge piece of building transparency in my classroom. Assessment is also not a mystery! There are no secrets. I am not trying to trick them. I am trying to teach them. Our digital learning platform allows for students to have easy access to assessments, immediate feedback and the ability to track their progress anytime. Students can see on any day what standards they have mastered, standards that still need developing, and the next standards in their learning progression. Students are more prepared for assessments with the learning targets clearly defined. 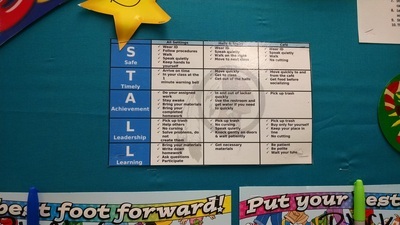 The aligned activities allow students to determine when they are ready to be assessed and when they need more practice. Students have taken ownership of their learning and the content required in the course. It has been so encouraging to see students admit that I have not fully mastered a standard and watch them self-assign homework in order to be prepared the next class period. I mean… do you know any high school students that self assign homework?!?! ​Additionally, I believe the implementation of transparency has helped develop the climate of my classroom. There is an honesty amongst the students. They are not afraid to ask each other for help because they have each experienced success in different areas. They have become a family and are happy to stop what they are doing to help someone else be successful. In short, I have been amazed at the successes of my students this year. I cannot believe the ground they have covered and the confidence they have gained. Transparency in the classroom is something I thought I had. It was something I thought every teacher just did. However, I have learned this year what true transparency is, and how by giving my students the complete picture they have been able to rise to the occasion and ROCK algebra! After five years honing my craft teaching first grade, I learned how to differentiate despite the curriculum demands imposed by administration. Now, I am fortunate to be a part of the personalized learning movement that provides a new promise of reaching every student’s academic needs. 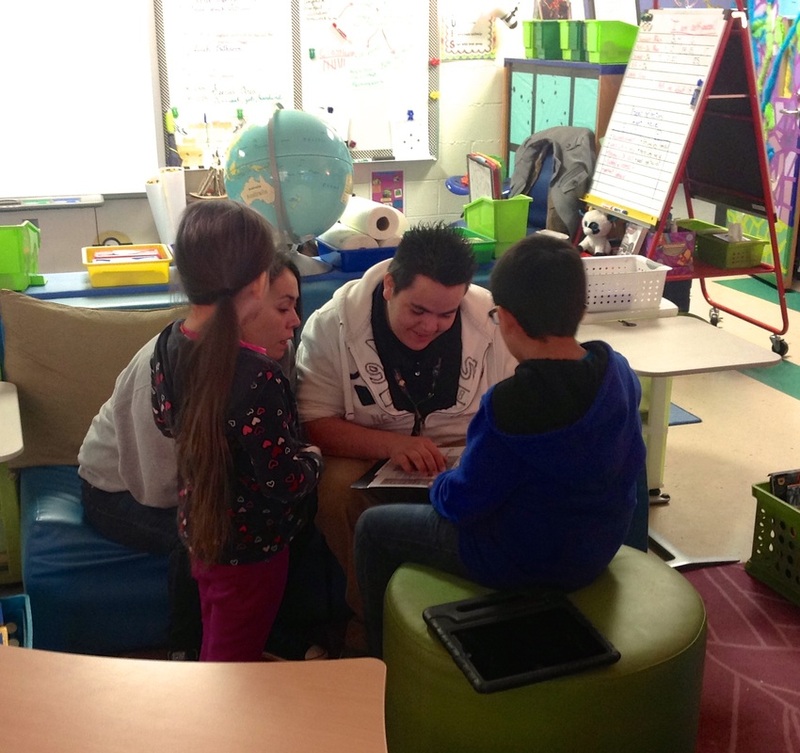 Charleston County School District (CCSD) is one of sixteen nationwide recipients of the Race to the Top District federal grant to increase personalized learning environments. CCSD stakeholders have started this work first by focusing on classroom culture, while providing opportunities for students to have a voice in their learning. At the beginning of the school year, teachers and students worked together to create a Shared Vision of what they hope to accomplish this year. Instead of following a set of rules decided by the teacher, students helped establish a Code of Cooperation to support accomplishing their vision. 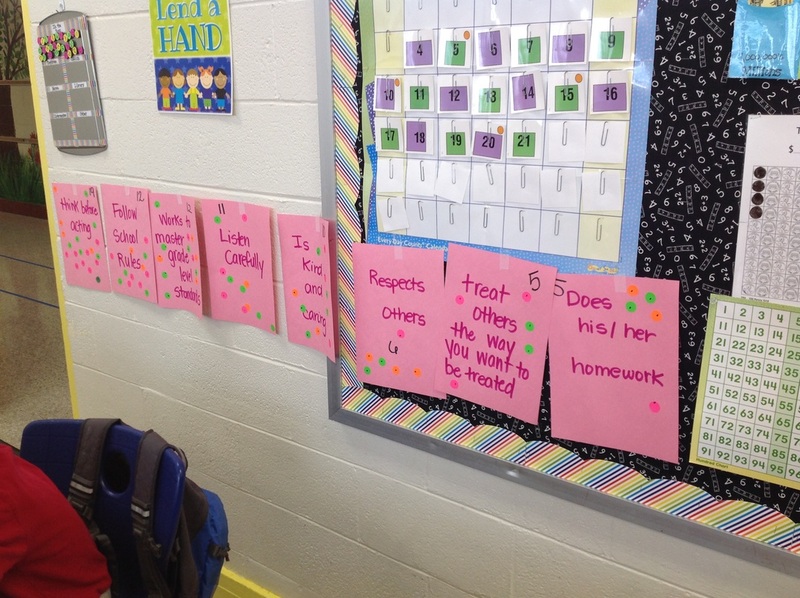 Now, students are setting behavioral goals that align with their class Code of Cooperation. Some students even utilize a Plan-Do-Check-Adjust goal-setting cycle, a method currently used in businesses around the world to monitor continuous improvement. Another piece to CCSD’s personalized learning journey is the integration of technology. Each student will have access to an iPad to use online-learning programs and apps as one way to demonstrate mastery of standards and increase 21st century skills. In the short time since the school year began, there has been a positive shift in school culture. 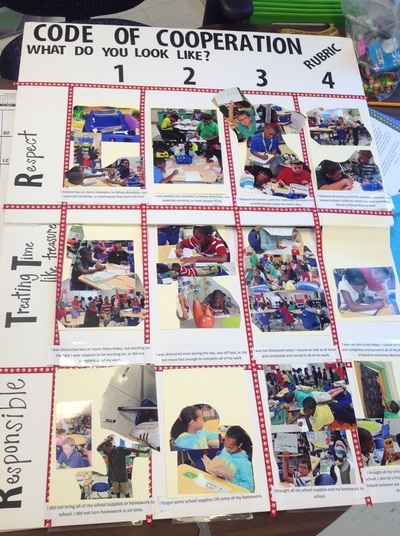 Students have ownership not only of their behavior, but their learning as well. Teachers are working with students to unpack standards and create learning pathways to master those standards. As we continue to implement personalized learning, there will be more project-based and challenge-based learning opportunities, which will provide rigor and meaning to learning. Personalized Learning is the future of education, providing a renewed promise that all students will receive the education they need and deserve. My classroom is a work in progress, and I am proud to say it will ALWAYS be a work in progress. Over the past six years, my room has never quite looked the same week to week. This is because I am constantly altering the way I teach/manage/organize in order to be the best version of myself as a teacher. This year, as I continued on my journey through personalized learning, I took on unpacking standards. In the process, a part of my room, a wall in particular, was transformed. It all started as one small chart, and then just kept expanding until it took over. I now have a learning wall- literally a wall that showcases all we are learning in the classroom. The students know that this is the hub of all things first grade. We sit on the carpet next to it to create our charts (oh, how I love chart paper and a good Sharpie marker). Don’t get me wrong, technology is amazing, but sometimes you just need to unpack what you are learning on paper! At the beginning of each new standard, I write out an “I can statement” on the dry erase board. The kids try to read along as I write it, and then we unpack and see what they already know about the content. After that, we create part of an anchor chart for the particular skill, and we put it under that subject. The learning wall is a “live document” as they say- constantly being added to, changed, and tweaked over the course of the week. If a student is struggling during an independent time, I may have them reference the wall. If I am working with a small group, all 5 of us may take a trip over to the wall as a refresher before we start. When guests come in and ask the kids what they are learning about, you guessed it- fingers point to the wall as they explain. This process has been great for me! I feel like I am more organized. I know what I want to accomplish, and it is seen in plain sight if I have taught enough information to cover the standard. It has also been great for the students as well. As you may know, it hurts your heart to ask the age old question, “What have we been learning about in science?” only to met with the sound of crickets. Students now know to look at the wall, and their memories of that amazing lesson you taught on Shadows are instantly triggered. As any teacher of personal mastery knows, goals are vital. My own goals surrounding the learning wall are to make it more student centered. I would like to have actual work posted under the standards, to show what a “level 3” work sample would look like. I would also like students to start taking pictures on their iPads of the charts before new ones are put up. This way they can look at them at their own pace if they have yet to master a skill and we (as a whole group), have moved on. Overall, the learning wall has forever changed the way I teach, and I recommend starting one (even if it’s initially just for one or two subjects); you will see firsthand how the students start to positively respond. In another six years, my learning wall will not look exactly the same, and I am excited about that. As for now, bring on the chart paper! Initially, as a first-year teacher at a personalized learning school, I had butterflies on my first day. I didn’t know about shared visions, SOPs (Standard Operating Procedures), Code of Cooperation, etc. I just wanted to be prepared. I just wanted to be liked by my students. I just wanted to change the lives of my students and positively impact their lives (as if that wasn’t huge enough). I just wanted to get through the first day, first week, and first month of school. Everything that I had learned in graduate school I was ready to put in place. I wanted to find ways to properly present my classroom management plan and begin teaching. I learned that presenting my classroom management plan was a lesson in itself, the longest lesson I’d ever taught (about 2 weeks). I genuinely believe my classroom management plan blossomed after the shared vision, code of cooperation, and SOPs were introduced. 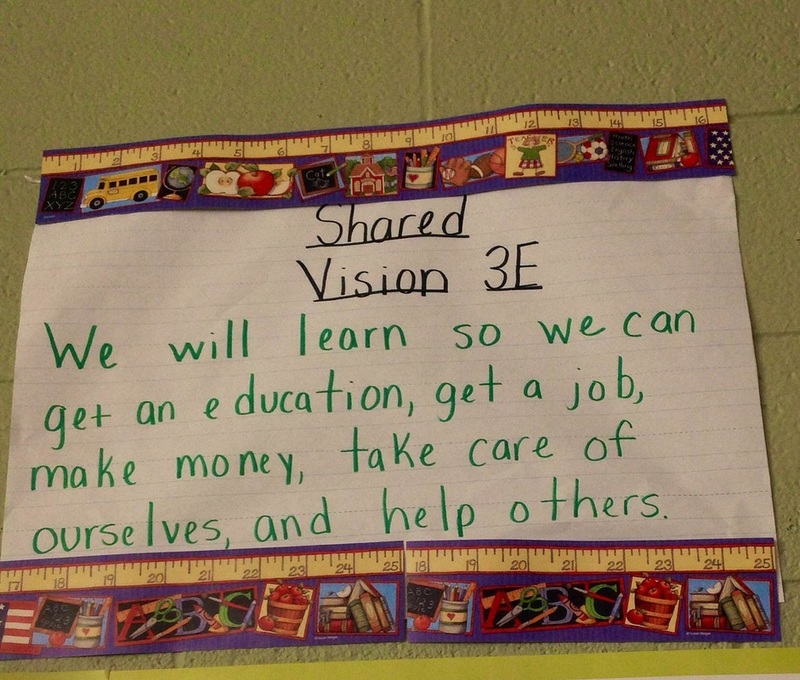 Our classroom shared vision is “We will learn so we can get an education, get a job, make money, take care of ourselves, and help others.” My class values the shared vision because each student can see their voice in it. 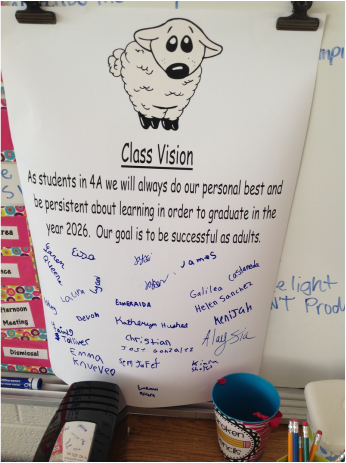 The shared vision is what I consider “long-term goals for right-now learning.” My students recite their shared vision daily during our morning meeting. They all can state the shared vision without looking at the poster display in class. The Code of Cooperation aligned with the shared vision and serves as a “how to” for students to ensure that they are working to meet the shared vision. 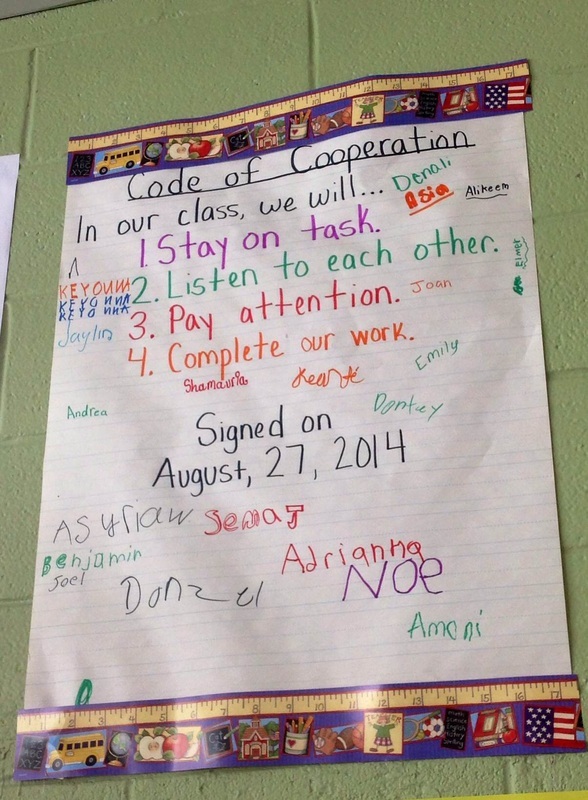 My students signed their name on our code of cooperation on August 27, 2014. They love seeing their names written on the code of cooperation poster! SOPs (Standard Operating Procedures) are procedures set in place by the students and teacher to address routines and other functions throughout the day such as: morning procedure, dismissal procedure, etc. 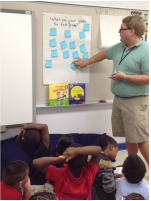 What I did in my classroom was help students identify a need for an SOP. We started off with one simple SOP for morning procedure and then week by week students began to identify the need for an SOP based on areas where the students struggled. We now have 7 SOPs and they range from talking to dismissal. ﻿ So far, our class shared vision, code of cooperation, and SOPs have allowed students to have a role in processes that govern the classroom. I believe they feel a sense of entitlement and importance in the decision process. I also feel that they are much more accountable and responsible for their actions since they took part in making the rules. It would be great one day to know that these very 3rd graders who created a vision for themselves actually live it out. I always encourage my students and say to them it would be the greatest feeling in the world to have them call me 10 years from now inviting me to their high school graduations. When students finish high school and go on to college they have already committed themselves to the beginning components of their shared vision. What are the Standards Asking Us to Do? Kids don't always understand the standards that teachers refer to when they're teaching a lesson. The easiest way to help students understand what they're going to learn is to "unpack" them first. This is a very useful strategy if you'd like your students to be able to answer the question, "What are you learning about today?". One of the components of Personalized Learning is the transparency of learning, where students explain the standards they're learning and track their progress toward mastery of the standards. Unpacking standards before teaching the content gives the students ownership of their learning. Participating in this activity before learning a new concept can also increase motivation by holding students accountable for personal academic goals. How do you "unpack" standards? ﻿﻿Jason Kraeger from Pinehurst Elementary has a great FREE template on teacherspayteachers.com that would be useful for this process. 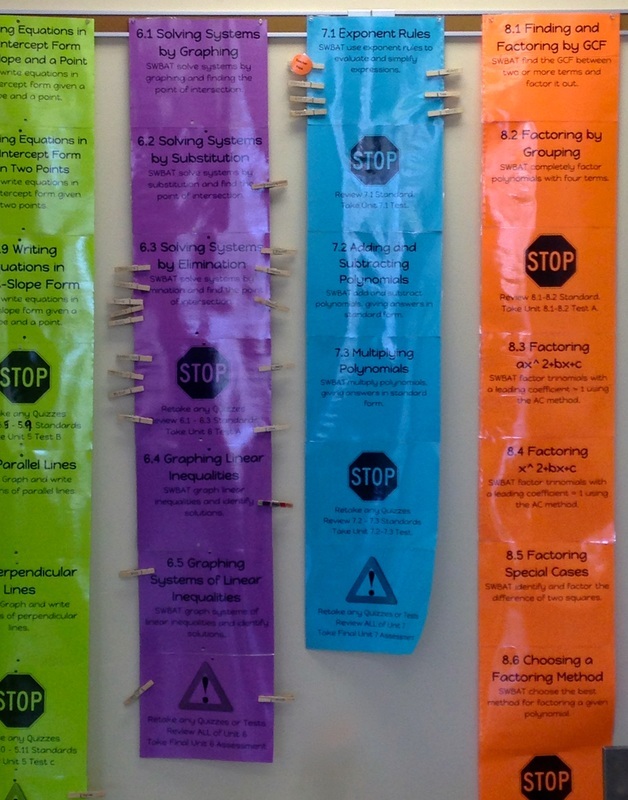 Teachers could also create a section on their board with tape (electrical or Washi) for each step of the process. A hand drawn template on chart paper would work as well. 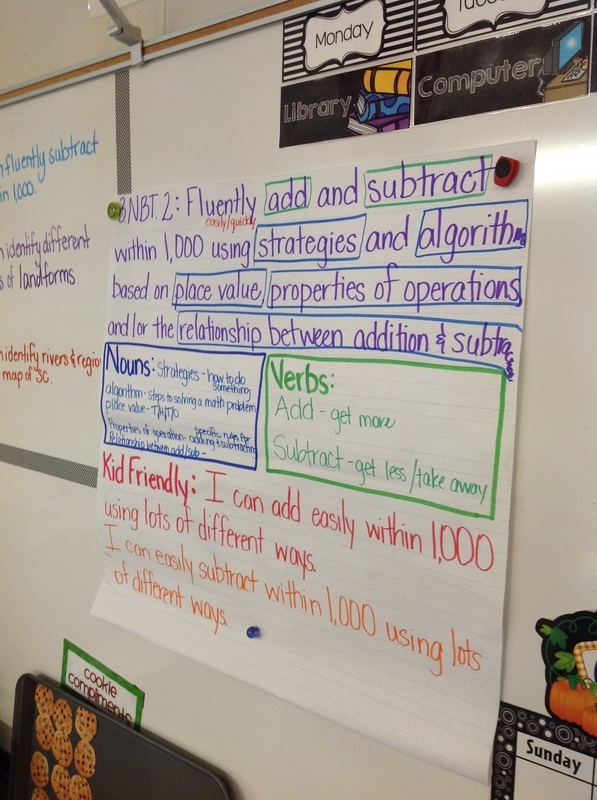 Students can even use this strategy themselves in a notebook, data binder or printed template﻿﻿. 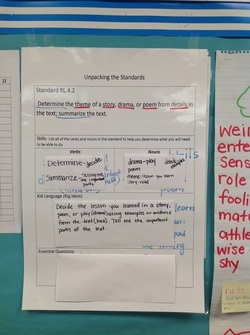 Write the standard out so the kids are aware of the original language. Example: 2.NBT.A.4 - Number & Operations in Base Ten /Understand place value. 4. Compare two three-digit numbers based on meanings of the hundreds, tens, and ones digits, using >,=, and < symbols to record the results of comparisons. As a group, pull out the ﻿verbs﻿ and nouns or terms to know. This will help students understand what they need to know and do. Teachers and students can do this by circling, underlining or highlighting the terms. Example: Compare two three-digit numbers based on meanings of the hundreds, tens, and ones digits, using >,=, and < symbols to record the results of comparisons. Use the words you've pulled out and change the original standard language to "kid friendly" terms. Example: I can compare 3 digit numbers with hundreds, tens and ones using >,= and < signs. Why am I learning this? How will I know I learned this? This will help them understand what they will be learning and how they'll know that they've mastered the standard. Some examples of unpacked standard and helpful video links are posted below. Try it today! Good luck and visit us again soon for next steps to Personalize Learning in your classroom! *These links also use www.nicertube.com, a less distracting way to present YouTube videos. This is a common question from many teachers, both those who are new to Personalized Learning and those who are familiar with it. There is so much to do with Shared Vision, Codes of Cooperation, and Standard Operating Procedures (SOPs). And don’t forget about teaching math, science, reading, and writing! So, where do you begin to create a class that is engaging, student-centered, and meets standards? 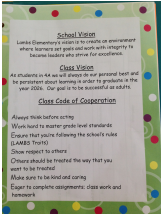 Amy Peak, 4th grade teacher at Lambs Elementary, created the class Shared Vision by brainstorming with students. They decided which traits Mrs. Peak and the students should demonstrate throughout the year. They discussed how the Shared Vision is the big goal that they wanted to achieve. 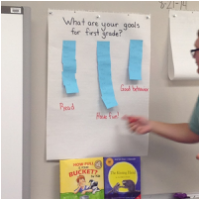 Justin Seagle, a 1st grade teacher at Lambs Elementary, began by having his students write in their journals, “What are your goals for first grade?” Once students had brainstormed their ideas, they used the Affinity Process, and each student used Post-its to write down their ideas. As a class, they read the ideas, organized them into categories, and then voted on the priority of the three categories they created. 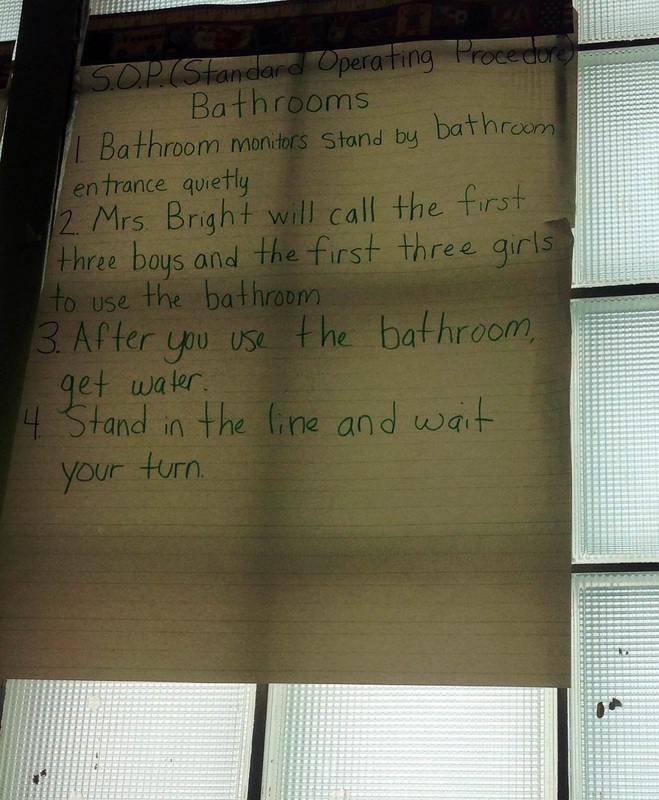 A Code of Cooperation replaces the “rules” that we all used to have posted on the walls. It is the “How” component. Students follow their Code of Cooperation to reach their Shared Vision. A typical conversation or prompt for students to answer may be, “What rules do you think we should have in our room?” or “What do you think a perfect class would look like, sound like, and feel like?” Mr. Seagle repeated the Affinity Process with his students by giving them the prompt “What rules should we have in our classroom?” After they made their Code, they wanted a way to remember it. They used the acronym WAVE to help and made the motion of a wave as they recited the Code, but that wasn’t good enough. So Mr. Seagle posed the question to his class and a student came up with the idea to make it into a song. So they did! When they got to music class that day, the students were so excited about the song, the music teacher helped them put their song to music on the piano. Of course the kids jumped at the chance! So now 1B has a musical Code of Cooperation! We all need a code to live by! Everyone has a code that they live by in some way. We have them in our personal lives, the business world definitely has them; so why should a school be any different? The key to a successful Code of Cooperation in a classroom is how you come up with your Code and make sure it is a way for the class to "make their shared vision come true", as a kindergartener once told me. There is a great book called Tool Time for Education that has a fantastic 2 page summary of what it is and the process (along with 59 other useful, quick-to-implement tools). 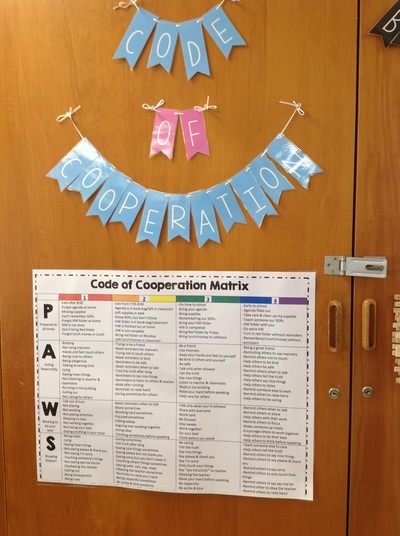 What is a Code of Cooperation? In a classroom, you may think of it a list of your class promises. It's a list of statements created by a team, which identifies the factors necessary for a high degree of cooperation. Here's a link to a school website that has some good examples of a Codes, including the picture below. First, any type of group brainstorming begins with questions of how the class should look, sound and feel like would work. You may start with those questions to a group, then the teacher would writes the answers on the board or chart paper. If you have older students, you may want to have everyone write answers on a sticky note, then place them on a corresponding chart paper with each question posted on them. The ways to get feedback is open to the teacher's or students' imagination. As long as you do this activity as a group where everyone has the chance to participate, the group will feel like they've had their voices heard. Once you get everyone's ideas, you can vote as a class to rank the choices from most important to least important. An activity called "Hot Dot" or "Power Voting" is a good one for this process. All you do is give everyone a certain number of stickers (the round multicolored stickers are an affordable option), then have them put a sticker next to their top 3 choices. Then you can tally up the dots to see which ones are the most important. Make sure everyone agrees with your final list before making it "official." Some schools have a "theme" that teachers sometimes use as the starting point for their code. PAWS, SOAR, TEAM, etc. Whatever your theme is, you can create key words for each, then assign behaviors. It's a little trickier to make it your own this way, but it can be done. Two of the pictures above are done this way. PAWS, for example, stands for Prepared at all time, Acting Responsible, Working to do our best, and Showing respect. Teachers then have the kids describe actions that would demonstrate each of the descriptors. What is being prepared, what is showing respect, etc. The numbered matrices above use a 1-4 proficiency scale so students can rate themselves on their behavior. This is great for collecting data! You'd be surprised how honest they will be! On the scales above, 3 is expected or "proficient" and 4 is above and beyond. The 2 and the 1 can be the "sometimes" and "not at all" sections. Remember, this code is to help the class to understand how they are going to meet the vision they created first. It's the class to-do list, so don't forget to review it daily and rate yourself to see how well you are doing. If you'd like more information on behavior matrices or proficiency scales in general, please come back! We'll be posting on these topics soon. Don't forget to visit the following resources if you'd like to know more about creating an awesome classroom culture by implementing Personalized Learning in your classroom!